THE ASTOUNDING BIRDLIFE OF THE KRUGER NATIONAL PARK. Virtually all visitors to Southern Africa visit the Kruger National Park where more than 500 bird species are to be found at various times during the year. Southern Africa has over 900 bird species found throughout the entire region so, in fact, more than half the total number of bird species found in the entire southern African region are to be found in the Kruger National Park in either a particular habitat or time of year or location. This is remarkable considering that the park occupies only 19 485 sq km. 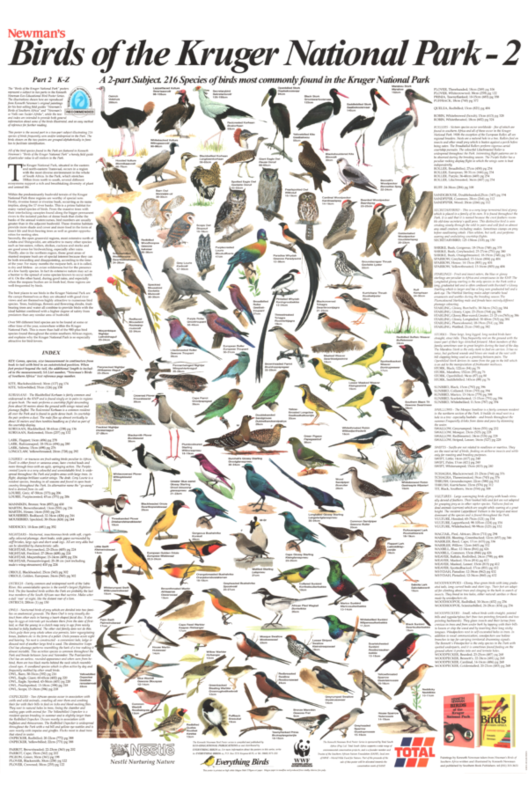 This poster is the second part of two posters divided alphabetically 1: A–K and 2: K–Z which together illustrate 216 species of the birds most commonly found in the Kruger National Park. Among the bird families represented on this poster are: kite, korhaan, lark, lourie, martin, mousebird, nightjar, oriole, owl, oxpecker, parrot, plover, robin, roller, sandpiper, shrike, sparrow, starling, stork, sunbird, swallow, swift, tchagra, thrush, vulture, warbler, waxbill, weaver, whydah, woodhoopoe, woodpecker. The Kruger National Park is successful in attracting a huge range of bird species because of the wide variety of habitats and food sources it offers. Such habitats range from bush areas, man-made dams and mini marshes, rocky hills, cliffs, gorges, and riverine forests. True sandveld areas are present in the north-east and southern sections of the Park . Among the best bird-watching areas in the Park are the riverine forest or riverine bush occurring along the 17 river banks – a prime habitat for many varied species. The open grassveld regions in the north are attractive to many species such as bee-eaters, rollers, shrikes, cuckoos and storks. Also in the northern region the great areas of mopane bush , after rains, when the mopane bushes are in fresh leaf, are hugely attractive to birds. The camps themselves are great viewing places for birds being situated with good river views with trees, many fruit bearing, flowers and shrubs all providing birds with ideal habitats. The two Kruger National Park bird posters are both outstandingly attractive posters and together present a wonderful window on Southern Africa’s amazing birdlife.